Rock And Beauty , Live In Las Vegas Straight From The Tape Vol.1. 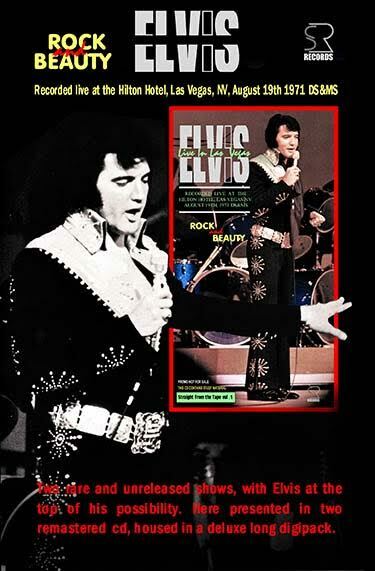 Available from the middle March, Rock and Beauty (SR Records) with focus on Elvis’ August 1971.Both the shows are previously unreleased taken directly from a first generation tape. This will be the first of three volumes that SR will publish inside the year with focus on August 1971. The SR attitude is to present Elvis at the peak of his possibility and without doubt in the Las Vegas August 1971 season Elvis still rocks and still beautiful, delivering maybe shorter shows respect the previous summer seasons , but still solid. If Rock is attitude the man still have it. The performance is terrific full and sharp. Here are presented two unreleased shows from the second week of the season. Both the show are very similar , the track list is minimized and the shows are practically identical, the afternoon presents in more the song I Got a Woman. We are happy and proud of the result we hope you can enjoy too, in spite of the limitation of the audience recording you can listen in a very balanced form all the instruments and Elvis super powerful voice. The shows are fantastic and the track listing is solid , giving us the best of the Season. All the songs are very well performed . Talking of best song is very hard, however you have Proud Mary and Johnny B. Good performed at the top of Elvis’ possibilities, but in the same moment the same happens with classic ballad Love Me Tender here still performed in both the shows or the pop new single I’m Leaving …. This the magic of Elvis in the 1971, a man singing with his own style all styles at the top of his possibilities. This new SR special Product will be the first of three volumes housed in a deluxe long digipack, containing a 12 pages of booklet with focus and details on the season including a collection of live photographs newspapers clips and memorabilia plus a high quality glossy 135 gram paper poster of 50x50 cm size and a high glossy paper bonus art card of 25x13 cm of size.. In matter to have a special collector item, the 400 copies will be presented with two different sleeves variation ( same sleeve, but in color and black and white).All the (400) copies will come hand numbered and individually sealed and Please remember!! Due to technical problems, the unreleased concert of August 24 ds will replace the scheduled August 19, 1971 MS in the upcoming new SR pecial Product. Thanks for your patience and support.. SR Staff. We know the DS from a soso sounding cd-r..so please be aware. The MS would be completely new but I never saw an SR release with a new show so I have my reservations. My guess is that it is just simply wrongly dated. I will check when its out..it could be what we have as Aug 18, 1971 DS..we will see. The shows are not bad though.